An extended version of this document including detailed numbers and case studies can be found in Müller, 2012. As noted by all scientists, the prices for journals and books are constantly increasing. In linguistics you can find paperback books for 125€ (Czepluch, Hartmut, Kasus im Deutschen und Englischen, Niemeyer, 1996, 376 pages, $0,46/0,33€ per page)) or hard cover books for almost 200€ (Handbuch der deutschen Konnektoren, de Gruyter, 2003, 816 pages, $0,33/0,24€ per page). The two volumes of the Handbook Syntax by de Gruyter (1993 1029 pages; 1995, 611 pages) cost $1006/718€ in total ($0,61/0,44€ per page). Another hardcover by Benjamins (Lee-Schoenfeld, Vera, 2007, Beyond Coherence: The Syntax of Opacity in German, Benjamins, 206 pages) costs $158/105€ ($0,77/0,51€ per page). The most extreme case seems to be the textbook Logik für Linguisten with 112 pages which is sold for $126.00/89,95€ ($1,12/0,80€ per page). 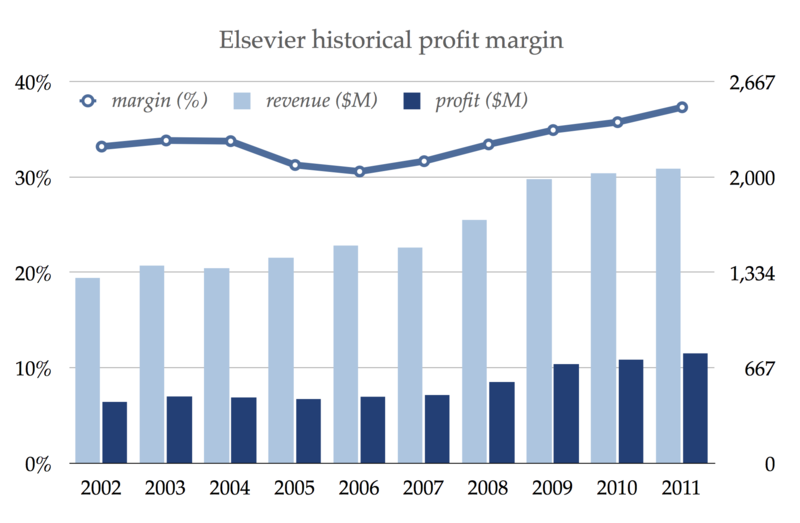 Large publishers like Wiley-Blackwell, Elsevier, and Springer Science+Business Media S.A. have profit margins over 35%. (Reed Elsevier Annual Reports and Financial Statements 2011, p. 9, see also Stuart Shieber’s blog post on Open Access for figures and analysis). 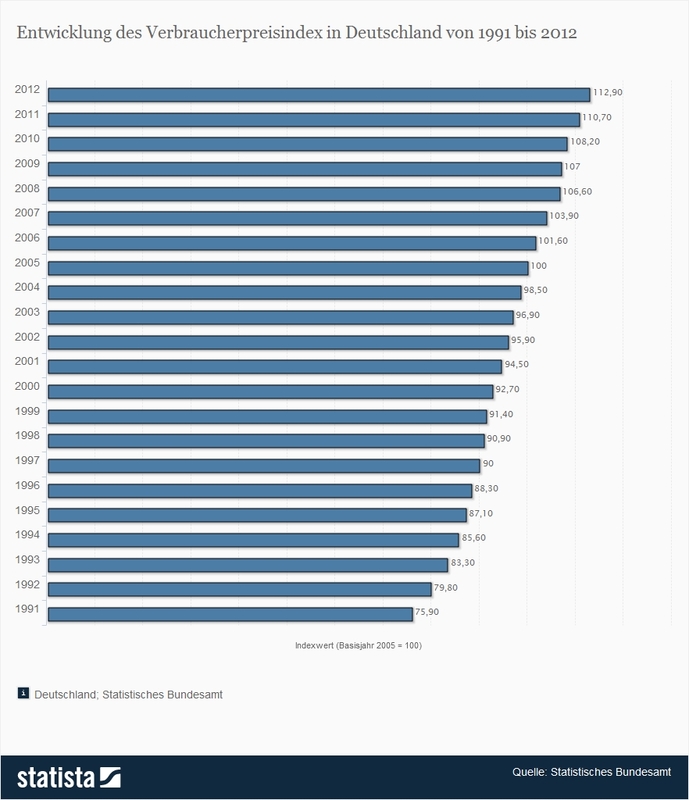 They increase their profits constantly: Elsevier 6% from 2010 to 2011 and Springer 5–7% per year (Berliner Zeitung, reuters, 19.10.2012). Some publishers raised book prices by more than 100% in the past ten years while consumer prices only raised by 22% (see image below). For instance, the VerbMobil book by Springer was initialy sold for 129.00 DM (65.96€) in 2000. The book is sold now for 139.05€. This is a price increase of 110.81%. Books are the tools of scientists. We need them. For instance a Handbuch (handbook) is something you use frequently. Few people will buy a book for over 100€. In addition buying the book does usually not include the right to access and store an electronic version of the work. Those who need the book in electronic form (for searching or accessing it in places where you cannot take heavy books to) have to scan the book and illegally store the file. Writing books, reviewing books for publishers, and copying them afterwards takes a lot of time. This time is usually paid for by state institutions or funding agencies. The publishers do not pay for it. On the contrary, some even require money from the authors to keep the book prices low (depending on the number of copies printed, this can be 1000€). When libraries buy our books, the state pays a second time. Here are two concrete examples: A German W3-professor (name known to us) spent one month reviewing a book for Benjamins. You may check the Wikipedia article about the payment of state employees to find out what this actually cost German taxpayers. Doing such work is the duty of scientists, it is our job, we enjoy it and are proud of the progress the field makes because of our contributions as reviewers. However, the problem is that the publisher now has a product that is better than it would have been without such work. The publisher will sell more copies and will make more money out of the book. In this particular case no honorarium was paid and if the reviewer had not asked for it he or she would not even have gotten a sample copy of the book. The book costs $150/100€ now and is way too expensive ($0.45/0.30€ per page). Another example is the books that appear in the legendary HSK series of De Gruyter. Authors do not even get a copy of their book. They get the right to download 10 journal articles (which would cost 400€ if you ever paid for them) and they can buy the book with a 30% discount. The distribution costs for books (distributor, bookshop) make up 55% of the total cost. Since these costs are saved when authors get their copies directly, De Gruyter takes the normal margin plus an additional margin of 25% from their authors. The final example shows that we even have cases of triple payment: Christiane Fellbaum reported a case in which a publisher wanted to charge her (personally) since she wanted to reuse a figure with another publisher. So we have to buy our own products in order to give them to another publisher from which we can then buy it again. So, we do a lot of work that is paid by the tax payer or not at all and we pay again when we buy our products. The solution to the problem is the publication on a central storage and archiving server in combination with print on demand services. The copyright is granted by the Creative Commons CC BY, which allows the work to be printed and figures to be reused, provided the original work is cited. The translation rights remain with the author. The authors can additionally put a PDF file of their work on their web page and for those of us who prefer printed books, printed copies will be available. An example of a print on demand service is the Amazon daughter Create Space. As of 21.08.2012 Create Space publishes a 15x23cm book (6”x9”) with 450 pages for $10.5/8.7£/10€ ($0,023/0,022€ per page, a factor of 20–50 cheaper!). (for a price calculator see https://www.createspace.com/Products/Book/). We will work with several print on demand services. Note that the main part of the costs of traditional books go to distributers and shops (up to 55%). This money is saved by using print on demand services for printing and distribution. Please refer to Setup and Vision for details. Publishing houses differ as far as quality control is concerned. Some ask researchers to review book manuscripts, some rely on the reputation of the respective authors and publish whatever they submit. We the scientific community will now organize the reviewing without the mediation of publishing houses (we do this for conferences anyway). The way the reviewing is organized is described in Setup and Vision. We are looking for linguists from all branches of linguistics who are willing to participate in work as series editors and/or in the review process and who want to take part in building a brand with a good reputation. The area of expertise of the group that worked out this original proposal is in data-informed theoretical linguistics, but of course book series in other research areas are possible and welcome. While you have full control over your product, the disadvantage is that you have full control of your product. This means that you have to do the proof reading and the type setting alone. Cambridge University Press estimates the costs for typesetting a 400 page book as 1000£. De Gruyter charges 1500€ for those authors who do not deliver camera ready copies. If you are willing to invest the equivalent of 1000£ in formatting the text on your own (for instance by learning how to use MicroSoft Word or Libre Office properly or even easier by learning how to write in LaTeX) you save this money and your readers will enjoy a cheaper book. If you do not want to learn to write your texts in a form that is usable right away, you can pay a professional typesetter for doing it for you without involving a publisher. Frank Richter and Cristopher Culy are currently working on LaTeX to Kindle translations that would also make it possible to publish typographically complex books including glossed and heavily crossreferenced examples, syntactic trees, OT tableaux, and feature structures. What we cannot do is travel around with a truck of books and present them at conferences. But we can establish a brand and we can promote it at conferences. Actually during show time at the end of our talks. Since the books are accessible, search engines will find them. Since students and researchers from economically weak countries will be able to access them, there will be a bigger audience for the book. Publishers send books to multipliers, known researchers in the field that may be interested in the book. The names are usually provided by the authors. Furthermore reference copies are sent to certain libraries (for instance the German National Library for books that are published in Germany). The question of the distribution of knowledge is independent of the question of how movies and music should be distributed. Not all of us share radical views about copyrights. It should be clear from what has been said above that the situation in science is different: The content that is published by science publishers is paid already (in most cases). It is the authors free choice to not use a publisher and keep the price of their publications low, retain the copy and translation rights and offer their work for free download and indexing.